Crowds turned out to join in the fun as the popular Pancake Races returned to the town centre. Back for its tenth year Horsham Pancake Races made a welcome comeback to the Carfax this afternoon (April 10). Competitors popped on their trainers, donned their sweat bands and picked up their frying pans as they raced around the makeshift course near the War Memorial. The event was due to be held on February 13 but was postponed due to heavy rain and high winds. 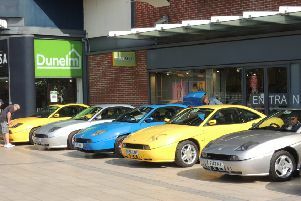 Despite being cloudy their wasn’t a raindrop in sight and organisers Horsham Rotary praised the public for their support. Cheers and music echoed round the Carfax as more than 20 teams raced up and down the course being spurred on by compère Garry Mortimer-Cook. The highly competitive Harris Lord retained their crown by winning the Sainsbury’s Cup while the St. Catherine’s Hospice Team took the Horsham Rotary Trophy for the winning Charity Team. The colourfully dressed team from the Amber Foundation won the Non-Stop Party Shop Best Fancy Dress Trophy whilst the best Individual Fancy Dress Trophy, donated by South East Hearing, went to Jon Santos from the Amber Foundation. Despite stiffer competition this year, Horsham Rotary Club pipped the Samaritans for the Waitrose Trophy for the best Over-40s Team. The Rawlison Butler Trophy for the member of the Winning Team who could produce the most skilful pancake flips was won by Josh Hemsley. Hundreds of pounds was also raised for charity. St Catherine’s Hospice received £600 for being both the charity nominated by the winning team and for winning the charity race whist £300 was also given to the Olive Tree Horsham Cancer Unit for being the most nominated cause by competitors.